Abaribe told newsmen that they advised the IPOB leader to carry out his activities within the confines of the law. Members of the Senate South-East caucus have asked Nnamdi Kanu, the leader of the Indigenous People of Biafra (IPOB) to conduct his members peacefully. 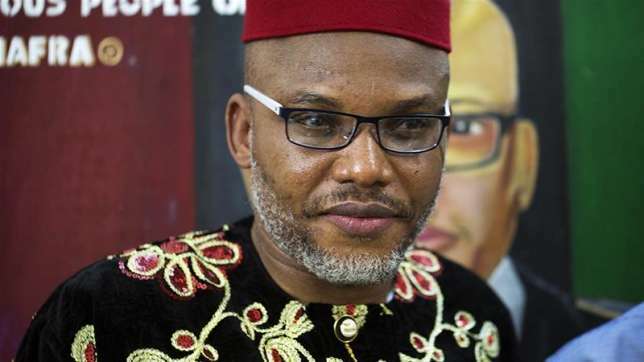 According to reports, the Senators, led by the Chairman of the Caucus, Enyinnaya Abaribe met with Kanu at his country home in Abia State on Tuesday, August 22, 2017. The caucus also called for the restructuring of the country and devolution of power to the states. According to Punch, Abaribe also said “I thank Kanu for assuring (the caucus) to conduct his members in a peaceful manner and within the ambit of the law. This engagement is a continuous process that will lead us to finding a lasting solution to whatever grievances that necessitated the agitation in Nigeria. Meanwhile, Nnamdi Kanu, in an interview, said IPOB will never resort to armed conflict or rebellion, notwithstanding the killings, arrest and arbitrary detention of its members.